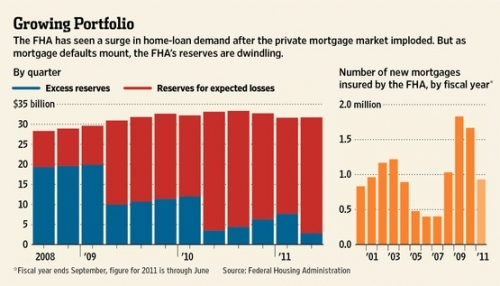 The FHA is losing money faster than the insurance premiums are coming in. A bailout is on the way. Everyone is familiar with the billions we are spending to bail out the GSEs, but little is known about similar problems at the FHA. So far through a hefty increase in FHA insurance and a large dose of head-in-the-sand accounting, the troubles at the FHA have been largely obscured from view. Despite the good job bureaucrats have done at hiding the problem, the FHA is facing major losses on its loan portfolio which has been expanding rapidly as the housing bubble began to deflate in 2007. Concerns are rising that the Federal Housing Administration could run out money if the economy doesn't recover soon, raising the risk the agency would seek a taxpayer bailout for the first time in its 77-year history. Since the mortgage crisis erupted five years ago, the FHA has played a critical role in housing finance as private lenders retreated. It backs about a third of all new mortgages originated for home purchases, up from around 5% in 2006. But, as the FHA prepares to release its annual financial report next week, a forthcoming study by Joseph Gyourko [see embedded document below], a real estate and finance professor at the University of Pennsylvania's Wharton School, estimates that the FHA faces around $50 billion in losses in the coming years. The study says only a “quick and substantial economic and housing market recovery” can avoid “substantial losses for American taxpayers.” The paper was commissioned by the American Enterprise Institute, a conservative think tank. Since we know a “quick and substantial economic and housing market recovery” is not forthcoming, it's safe to assume the American taxpayer will see substantial losses on the FHA portfolio. The study says the losses will be spread over a period of many years and are unlikely to bankrupt the agency this year or next. The study isn't the first to predict the FHA's insolvency. Last year, economists from New York University and the New York Federal Reserve issued a paper warning of the growing likelihood the agency would need to a taxpayer bailout. FHA officials disputed some of that report's findings. Last month, Paul Miller, an analyst with FBR Capital Markets, warned that the largest U.S. banks could face billions in losses if the FHA tries to push back defaulted mortgages onto the lenders that originated them. “Unless home prices rebound, I don't understand how they're able to avoid a restructuring and a Treasury infusion,” he said. I think we all know how that will turn out… The FHA will not make the banks buy back their toxic crap because then we would have to bail out the banks again. It's far easier to simply bail out the FHA. The government has to bail out the FHA, but it does not have to bail out the banks. It would be too politically unpopular to bail out the banks, so the losses will be kept in the FHA so the bailout can be contained there. FHA officials said they couldn't comment on Mr. Gyourko's paper because they hadn't reviewed it. The FHA's independent audit is likely to show that while losses are rising, it will maintain positive reserves assuming the economy doesn't dip back into recession, say people familiar with the matter. Still, the Gyourko study along with the FHA's own annual report could have political ramifications. Some Republicans have pushed for the FHA to begin raising its down payments. Higher forecasted losses could also force the agency to raise its insurance premiums paid by homeowners even higher. Despite the fact that the FHA should raise its downpayment requirement and its insurance premium, neither one is going to happen because the effect it would have on the housing market would be too politically unpopular. We are already having difficulty finding wam bodies with jobs to clean up the foreclosure mess. If we make the qualified buyer pool even smaller, the market bottom and ultimate recovery would be even further off into the future. The FHA has long served first-time buyers and borrowers with modest incomes. Its market share collapsed during the housing boom because it didn't abandon underwriting standards. The one and only thing the government did right during the housing bubble was to leave the FHA standards alone. Since the FHA is a true government agency and not a quasi-governmental body like the GSEs, it has no pressure to loosen its standards to maintain market share during the bubble. U.S. home prices inched 0.2% higher in August, according to a closely watched index released Tuesday. That prompted one economist to see a “modest glimmer of hope” for the downtrodden housing market. Mitra Kalita has details on The News Hub. A lot of that business returned after the private mortgage market's implosion in 2007 and sharp tightening by Fannie Mae and Freddie Mac in 2008. The FHA, which is funded through the mortgage-insurance premiums it collects, doesn't make loans but instead insures lenders against defaults. At the end of August, it guaranteed 7.2 million mortgages worth $1 trillion, a record sum. It held nearly $31.7 billion in reserve at the end of June, of which all but $2.8 billion was set aside to cover anticipated losses. They are only expecting to lose $31 billion on its trillion dollar portfolio? Since the vast majority of these loans were underwritten with 3.5% down payments, most of this portfolio is underwater. There is no way they will only lose 3% on a trillion dollar portfolio of underwater loans. The bulk of the FHA's anticipated losses stem from loans made in 2007 and 2008, when the financial crisis was at its peak. More recent loans have among the best credit characteristics the agency has guaranteed. Still, the majority of homeowners taking out FHA-backed mortgages have very little equity—the minimum down payment is 3.5%. In reality, these borrowers have no equity. If the transaction costs between closing costs and commissions is about 8%, they are 5% underwater the day they close on the loan. WSJ Heard on the Street columnist David Reilly stops on Mean Street to discuss the merits of the government's plan to help some refinancing homeowners. Because home prices have fallen sharply and continue to decline in many markets, many borrowers are underwater and at risk of default if they lose their jobs or experience other financial shocks. Losses also can occur when borrowers simply walk away from their homes. “I don't think many of the borrowers truly understand what a risky position they're putting themselves in,” said Mr. Gyourko. He estimated that more than half of all homes with FHA loans are worth less than the outstanding debt. To assume only half the the FHA portfolio is underwater is wishful thinking. These people were underwater from the day they bought, and prices have been going down steadily for the last five years. The real number of effectively underwater FHA loan owners is well over 90% from this era. Based on the dramatic expansion of the portfolio since 2007, it's more likely the percentage underwater on the total FHA portfolio is 75% or more. If the FHA's reserve account were to run out of money, the agency has what is known as indefinite budget authority to draw on funds from the Treasury Department without a congressional appropriation. In other words, the FHA has a blank check. FHA officials have taken steps to shore up the agency's finances, including twice raising the insurance premiums that borrowers must pay in the past year. Last year, the agency raised down payment requirements to 10% for borrowers with credit scores below 580. WSJ's Jon Hilsenrath reports on a Fed plan to revitalize the housing market by purchasing mortgage-backed securities. David Stevens, who served as the agency's commissioner for two years until he became chief executive of the Mortgage Bankers Association in April, said the Obama administration had moved aggressively to shore up reserves without undermining housing markets. It may be better off than any other portfolio, but that isn't saying much. The GSE portfolio is a disaster, and the private-label MBS pools from the bubble are not performing well either to say the least. Mr. Gyourko says the agency is underestimating by billions of dollars the future losses related to borrowers who used an $8,000 federal tax credit to fund their down payment. The paper also says the FHA is underestimating default risk related to unemployment. It's been pretty well documented that buyers paid $30,000 to $40,000 more to obtain the $8,000 FHA tax credit. Everyone who bought the bear rally is substantially underwater. The study could also reignite debate over the government's role in stabilizing the housing market. Congress is now considering a proposal to restore higher FHA loan limits. WSJ's Alan Zibel heads to Mean Street to discuss the White House's proposed program to draw private investment back into government-backed Freddie Mac and Fannie Mae mortgage programs. Mr. Gyourko says he isn't advocating an “immediate withdrawal” by the FHA, which he said could create a “real risk” of future price declines. Unfortunately, Kenneth Rosen is right: without the FHA, the housing market would crash even harder, and the losses to the GSEs and the FHA itself would be even larger. However, Mr Gyourko is right too: the benefits must be worth the risks taxpayers are taking on. Right now, these risks are far too high. Taxpayers are writing a blank check through the FHA to stabilize the housing market. We aren't accurately evaluating this cost today, and the losses are mounting. Realistically, we won't do anything differently until the market puts in a durable natural bottom. At that point, we may raise the FHA minimum down payment and insurance premiums. realtors and mortgage brokers will whine about “killing the recovery,” but it's essential to protect the American taxpayer — to protect you. The former owners of today's featured property paid $580,000 on 7/29/2005 using a $464,000 first mortgage and a $116,000 down payment. Apparently, they couldn't afford it. The property went into foreclosure on 8/30/2011, and the bank paid $439,245 which was the outstanding balance on the loan. If they get their asking price, the bank won't lose much on this one; the former owners, however, have lost everything. Sometimes, that's the way it works out. FANTASTIC END UNIT TOWNHOME NESTLED IN A VERY PRIVATE LOCATION IN THE HIGHLY SOUGHT AFTER WOODBRIDGE PARKVIEW COMMUNITY. THIS WONDERFUL HOME HAS IT ALL. LOVELY FLOOR PLAN WITH 3 BEDROOMS, 2.5 BATH, COZY LIVINGROOM WITH FIREPLACE, CATHEDRAL CEILINGS, PLANTATION SHUTTERS, OPEN KITCHEN WITH DINING AREA AND GOOD SIZE PATIO. CLOSE TO SHOPPING, SCHOOLS, ENTERTAINMENT, FREEWAYS AND MUCH MUCH MORE!! This entry was posted in Library, News on November 21, 2011 by IrvineRenter. Everyone I know that has recently financed a home has used FHA and it was a struggle for them to come up with the 3.5% down. Good God! I hope you are exaggerating. How would you characterize the people you know who bought houses? Middle Class? Poor? 1/%? (I assume not, or we’re in even deeper trouble than we think). Most of the buyers who offer on my Las Vegas flips are FHA buyers, and they are solidly middle class. I’ve come to the conclusion that most people in today’s world don’t have a pot to piss in. I’m sure we’ll be hearing that most people aren’t even close to being prepared for retirement. Being 60 years old and only having 60K saved for retirement isn’t going to cut it! Retirement? What is that? Remember: Retire=Expire! The one thing FHA should cease is participation in reverse mortgages. In today’s market, a reverse mortgage is the worst lending instrument ever conceived. So does raising the FHA limit back to $729k make this bailout more likely? It certainly increases their risk. This change (returning FHA’s loan limit to $730K) is effective immediately too. To me it’s an obvious attempt to make up for the lost move-up market and support prices in the $450K to $750K range in markets like Irvine. It won’t stop prices from falling, and it will increase the FHA losses, but it may help banks offload some more properties at somewhat higher prices. I’ve made that mistake plenty of times, but this one was a cut and paste from a lyrics site. No grammar for you! Come back, one year! I always wanted to meet an internet grammar corrector in person. I have a certain vision in my head on what they look like and what their “in-person” personalities are like. I really want to know if it is true. I’ll only correct grammar in a blog comment, if the author is calling someone else stupid while using horrific grammar. Then it can be fun. I think this study is likening IR to an infected diseased parasite who’s spreading his vile disease to otherwise completely healthy homeowners. And that is totally different from “healthy home buyers” taking advice from friends at work, local realtors, pals who are mortgage brokers, who talk them into making buying decisions they cannot afford in the first place, shouldn’t have any business buying because they haven’t even a remote idea of banking, finance, debt, what’s happening in the world….please. How does that article determine that FHA is set to lose $50B total, given that their chart shows FHA to be losing $30B *per quarter*? Aren’t we talking more like $300B? No, you aren’t missing anything. Their study has rosy assessments on appreciation resulting in less future losses. Hence, they only believe they will lose $50B when in reality, they will lose much more. So, it’s kinda like our public employee pensions assuming 8%+ returns for years/decades when most forecasters believe 4%-5% is as reasonably high as you can anticipate? The first time that I heard about California public pensions getting an 8% guaranteed yield I almost choked. “Tens of thousands of California state workers are taking advantage of a perk that pays them pension benefits for years they don’t actually work, and reformers looking for places to cut have put it at the top of the list. My wife is a teacher and I looked into buying airtime after reading about “what a great deal airtime is to buy.” Without getting into the calculations (but I certainly can if you want), it didn’t make sense to buy it. My wife and I would need to live at least 20 years after she retired to break even on what it would cost to buy the additional 5 years of service time today (and that was using a conservative return figure). I would rather be able to invest/access that money over the next 25-30 years as opposed to have it locked up in some pension fund that I can’t access and that I may not live to get back (not to mention the political uncertainty surrounding public pension funding generally). No thanks. WHOA!! This is a fantastic idea, it sound like they’ve thoroughly thought this through..NOTHING can go wrong with this scheme..absolutely NOTHING..
Quote: ” UK Taxpayers will underwrite mortgages totalling hundreds of millions of pounds under plans to ”unblock” the housing market and revive Britain’s flagging economy. The Prime Minister, David Cameron, and his deputy, Nick Clegg, want to help first-time buyers of new homes by carrying part of their mortgage risk. They also propose subsidising the construction of 16,000 homes by giving £400 million ($631 million) of taxpayers’ money to developers”. Well without the FHA I could not have purchased and I take home some pretty decent money for a man my age. I just today bought a little fixer-upper in Yucca Valley for my full time residence, just outside of the Joshua Tree Nutritional Park. I am 57 years old and tired of renting my little duplex in Oceano with rent going up every month thereabout, and renting in Irvine before. Since this place is in need of a lit of work, right down to new tiles and absetsto removal, I used the HUD 203K loan. I will report back to let you all know how this works out. Surprised more people don’t talk about this area. It is a little remote and has real snakes but is breathtakingly beautiful country. I will have to fly out of the Palm Springs airport for work now and then until I can complete my helicopter pilot training, which will help with the commute. Great little area. Cheap as Hell. Hot as Hell too! Maybe because it’s remote, has snakes, and is hot as hell? Hell, you’re too soft! Snakes pretty much mind to their own. It gets hot, but it snows, too and San Bernardino Mountains are right there. Remoteness is good for when you get tired of Californians. After growing up in Carpinteria and seeing what the gentry did to that area, the desert is the only sane place to live in my book!